My beautiful Mum, peacefully passed March 28. Heaven's garden now has its little flower. You will be forever in our hearts and memories. I love you Mum. 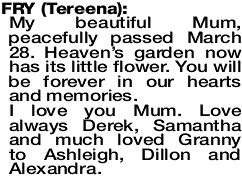 Love always Derek, Samantha and much loved Granny to Ashleigh, Dillon and Alexandra. 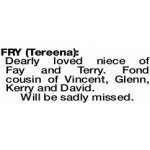 The Funeral Service for the late Ms Tereena Fry of Albany, formerly of Como will be held in the East Chapel of the PINNAROO Valley Memorial Park, Whitfords Ave, Padbury at 3.30pm on MONDAY (08.04.2019). 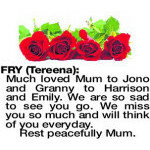 Much loved Mum to Jono and Granny to Harrison and Emily. We are so sad to see you go. We miss you so much and will think of you everyday. 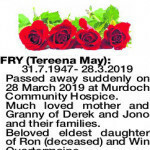 FRY TEREENA MAY 31.7.1947- 28.3.2019 Passed away suddenly on 28 March 2019 at Murdoch Community Hospice. 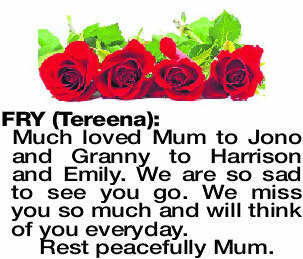 Much loved mother and Granny of Derek and Jono and their families. Beloved eldest daughter of Ron (deceased) and Win Quartermaine. Beloved sister and sister in law of Venita and Dieter, John and Liz, Danielle and John. Beloved Aunty of Guy and Anna, Sally and Jenna, Shannon and Andrew and Great Aunt to 8. Taken from us way too early and will be greatly missed. Very much loved sister and sister in law of Danielle and John. Much loved Aunty T of Shannon and Sean, and Andrew, and Great Aunt of Jackson and Austin. Ours of you, will last forever. Much loved sister and sister in law of John and Liz. Special Aunty to Sally and Ron, Jenna and Mick. Adored Great Aunt to Kate, Alex, Tom and Olivia. No more Down the Hill. 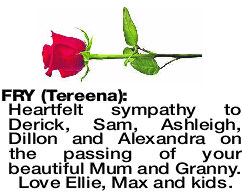 Heartfelt sympathy to Derick, Sam, Ashleigh, Dillon and Alexandra on the passing of your beautiful Mum and Granny. Love Ellie, Max and kids. Dearly loved niece of Fay and Terry. Fond cousin of Vincent, Glenn, Kerry and David. Precious memories of Ongerup school days and farm life. We enjoyed swapping weekends at P.P. or Quartermaines. Our deepest sympathy to Win, Venita, John, Danielle and all families. Calm, compassionate Tereena, rest easy. Love Veronica, Chris and Moira. Deepest sympathy to dear Derek, Jono and families. Friends since Miling days. We supported each other on many occasions during this time. Rest in peace Tereena, I feel so sad I have lost you. Farewell dear friend. My thoughts and love are with all the family.